John McDonnell, managing director, with Harvard’s Made in Britain trophy. 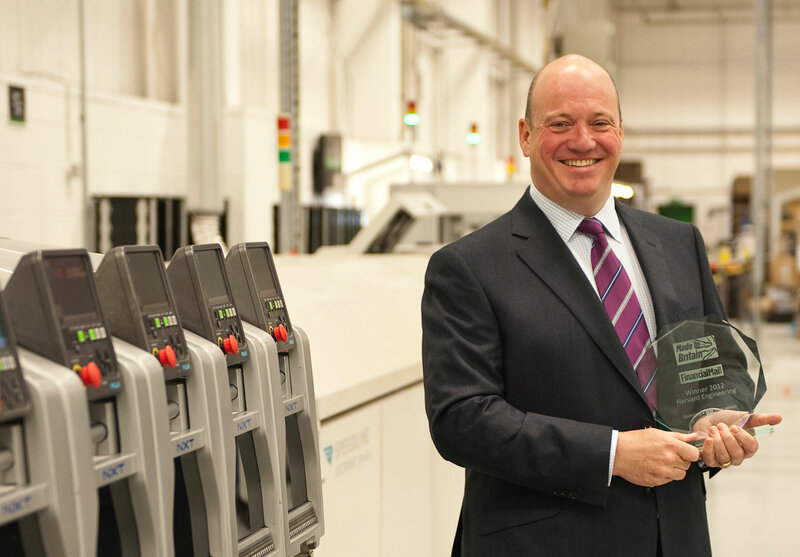 Harvard Engineering, world leader in the design, development and manufacture of LED drivers and control products for the lighting industry, has been announced as the Judges’ Choice winner of the Mail on Sunday’s first Made in Britain Awards. Harvard triumphed over seven other shortlisted companies from across the UK to win the coveted overall prize, which was presented by James Caan from Dragons Den at a luncheon, at the Institute of Directors (IoD) in London on Monday 21st January. Harvard’s story stood out to the judges, who described the company as very ‘innovative’ and ‘ahead of the curve’, spotting new markets and making the most of those opportunities. The judges also said Harvard stood out for its ‘impressive finances, which are clearly very well managed’, adding that even ‘on a numbers basis alone this company is very impressive’. Harvard was established in 1993 by John McDonnell after he spotted a gap in the market for electronic ballasts for compact fluorescents lamps. Since then, and despite the current economic climate, the company has continued to grow to become one of the leaders in the lighting sector, with over 280 employees, an innovative range of products, including the LeafNut wireless monitoring and control system for street lighting, and the revolutionary range of energy saving CoolLED drivers. In the past couple of years, Harvard has invested more than £3 million in a 40,000 square foot manufacturing facility in Wakefield, as well as opening offices in Germany, France, Italy and USA. In 2011, the company won the Queen’s Award for Enterprise, in the innovation category, as well as the Innovation category at the National Business Awards. The Mail on Sunday’s Made in Britain Awards were launched in 2012 to celebrate successful and innovative companies manufacturing in Britain.